This project started out with a large broken piece of insulation Styrofoam, some scrap wallpaper and a scoop of leftover dry wall compound that we wanted to recycle. We decided to try to make some kind of art from these leftover materials. The great part of this project was that the art piece would be very light and hang on any wall with just a small nail or piece of double-sided tape. 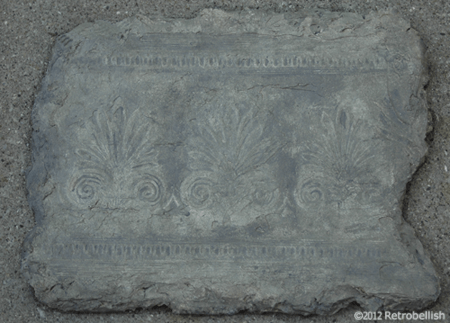 I decided to try and make some kind of faux stone tablet relic. I started out by breaking away pieces from the edges of the Styrofoam in an uneven pattern all the way around to give it a broken stone tablet look. I then added a coat of drywall compound across the whole front and sides of the Styrofoam piece, and then cut pieces of the scrap textured wallpaper about an inch shorter from the edges of the Styrofoam (loosely following the jagged shape of the Styrofoam) and pushed it right into the drywall compound. Using my hands, I smoothed some drywall compound over the wallpaper covering most of the wallpaper edges, but smoothing out the compound to reveal the main wallpaper details. While the piece was still damp, I painted the whole thing with a taupe acrylic enamel paint. The reason for this was to get the deep taupe color into the drywall compound while drying and with a damp paper towel I gently removed some of the paint away from the details. I then let the piece dry for a few days and repainted the whole piece again, highlighting the raised points with a darker taupe to accent the piece. After everything was dry, I placed a very small nail into the wall and gently pushed the Styrofoam art piece into the small nail. Styrofoam is a very versatile and fun medium to work with because of its light and smooth surface — it lends itself to many craft projects.